This week I sent the first round of revisions on SURVIVING SANTIAGO to my editor at Running Press Kids. With the manuscript out of my hands for a few weeks, I have some time to reflect on its long path to publication. SURVIVING SANTIAGO began in summer 2007 when Sandy Taylor, my editor at Curbstone Press, who had just accepted the manuscript that would become Gringolandia, broached the idea of a companion from the point of view of Daniel’s younger sister, Tina. Various beta readers commented on what an interesting character Tina was — an academically-gifted but immature 12-year-old who had far more difficulty adjusting to life in the United States than her outgoing and athletic older brother. Daniel was very much a chameleon — someone who tries to fit in wherever he goes and avoids attracting attention to himself. Tina was the opposite — a girl with strong beliefs, desires, and ways of doing things. As I was writing Gringolandia, I thought about what Tina would be like in a few years. Daniel’s girlfriend, Courtney, imagined her as “tattooed and pierced.” (Anyone who reads Gringolandia will realize that Courtney thinks she knows more about people than she really does.) So I welcomed the opportunity to write another YA novel from Tina’s point of view. All that summer, as my husband, my daughter, and I traveled through Spain, I wrote the first draft of SURVIVING SANTIAGO, which had a different title then. As I finished each chapter, I showed it to my daughter, Maddy, who was 16 — the same age as Tina in the story. Maddy suggested lines of dialogue and plot twists, some of which I incorporated and some of which later got written out. In all, SURVIVING SANTIAGO has been the most fun of my novels to write, in large part because I wrote it on this really fun family trip and bonded with my teenage daughter. But it was also a entertaining story, full of romance, intrigue, and humor. When I finished, however, I had a really rough draft, and I wanted to polish it a bit before showing it to Sandy. I also didn’t feel comfortable with my ending. I put it aside for several months, as writers are urged to do, but during those months he passed away suddenly. I didn’t pick up the put-aside manuscript for nearly two years. I had a lot of extra work related to the publication of Gringolandia since my editor was no longer alive and the small press was in the process of being sold. In addition, I didn’t know if I’d ever find another publisher and editor who appreciated my work the way Sandy did. What motivated me to return to the manuscript was a whole-novel revision workshop. Someone told me about a workshop that the noted editor and author Barbara Seuling held in Vermont every summer. That year, she also offered an introduction to an agent, which I needed because I no longer had a regular publisher for my work. So I took the draft, with its rough edges and problematic ending, to Vermont. I was so busy with my manuscript at the workshop that I didn’t take any pictures. 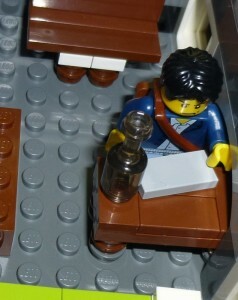 Here’s my Lego guy writing instead. Of the various critiques and exercises that we did in the four-day workshop, the one I most remember was the Shrunken Manuscript activity developed by Darcy Pattison and used by Barbara and several other editors and authors who run workshops, including the wonderful Harold Underdown who talks about it and links to it on the Highlights Foundation blog. Through the Shrunken Manuscript, I was able to identify the most compelling chapters and scenes of my manuscript as well as the relationships between Tina and her father, and Tina and Frankie Zamora, the 18-year-old boy she meets while visiting her father in Chile. At the time, I didn’t know whether I’d written a story about a teenage girl and a father she hadn’t seen in many years, or a romance, or a bit of both (and if it was a bit of both, whether the two relationships had any parallels). And if it was a romance, I certainly didn’t have the expected Happily Ever After ending. Marking up the Shrunken Manuscript helped me to see all those aspects of the story, and their relation (or lack thereof) to each other. As a result of the workshop, I threw out the last third of the novel and wrote a completely different ending (no comment on the Happily Ever After). I also started submitting the manuscript and found an agent. It wasn’t the one via the workshop, though I did get an encouraging rejection letter with useful suggestions, but Ellen was the second agent I queried. Though we again put aside the manuscript for a while to go forward with Rogue, I would never have sold SURVIVING SANTIAGO without Barbara Seuling’s workshop. Workshops with experienced authors and editors can help writers get unstuck, as I was with SURVIVING SANTIAGO, or to see and understand the flaws in a piece that attracts nothing but form rejections (as I experienced in an earlier workshop with the manuscript for my adult novel, Dirt Cheap). When Harold Underdown, whose blog I read regularly and who runs a workshop at the Highlights Foundation in Pennsylvania that’s very similar to Barbara’s workshop, asked my to get the word out about his Revision Retreat this summer from August 13-17, I agreed to do so. A member of my critique group attended his picture book workshop and appreciated his constructive criticism, his ability to identify and explain weaknesses in her manuscript in a way that made her eager to get back to work fixing them rather than feeling overwhelmed or demoralized. That’s really the best kind of critic — one who makes you eager to revise and convinces you that you, and only you, can make that particular story awesome. I loved hearing about Surviving Santiago’s journey, Lyn. 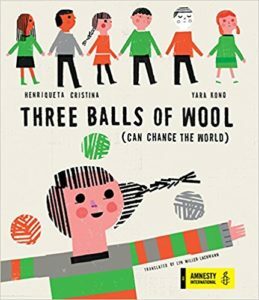 And I’m thrilled it’s found a home at Running Press Kids! Thank you, Sandra! The official announcement hasn’t come out yet, but my agent said I could say something on my website. But do look out for it! Great story, Lyn! Like Sandra, I’m glad you found a home for this book! That’s so exciting! Well, it’s not official until the announcement is published, but that will be later this summer. I consider myself fortunate, because this book had been sitting in a trunk for quite a while.